This Champion trainer brings his methods to the screen in a very understandable demonstration of tasks and talent. You will want to replay this DVD over & over as Brian addresses many important issues & problems and how to conquer them. How do you stand out in a pen of competitive hunt seat horses? How to choose a natural athlete to make your job easier. Which snaffle bit has the best profile going down the rail. How to peak your horse for the big shows. Exercises for each gait to get the most movement from your horse. How not riding effectively effects your horse's step. How to get a good rail position. The importance of mentally portraying the look of a winner. 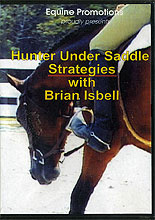 Brian demonstrates methods and techniques for a range of HUS riders fromm the beginner to the professional. It is a "must have" item if you want to be competitive in the show pen, and get the most out of your Horse.